Who Is American Airlines AAdvantage Good For? Long a favorite among frequent flyers, American Airlines AAdvantage has garnered the Freddie Awards (the top honor for frequent flyer programs) for the Program of the Year and the Best Elite Program for three years straight. But it’s in a really interesting position these days for two reasons: its merger with US Airways and the huge changes going on with the United and Delta programs. AA’s program will change in some way in the coming year and a half as the merger completes, but it’s unclear exactly what those changes will be. Some adjustments have already taken effect, such as the dissolution of the popular One World Explorer rates. But American fans are hopeful that changes that come will be better than the ones in other major domestic programs because it’s AAdvantage has always been a generous program for frequent flyers. Overall, changes aside, AAdvantage is a strong program for several reasons. Award availability is generally great, even at the lowest redemption rates, which can be substantially less than other airlines thanks to AA’s great off-peak rates. How Can You Use American Airlines Miles? American Airlines has one of the most straightforward booking processes of the major domestic airlines. You can find awards online easily for award flights with partners airberlin, Alaska Airlines, British Airways, Finnair, Hawaiian Airlines and Qantas Airways. 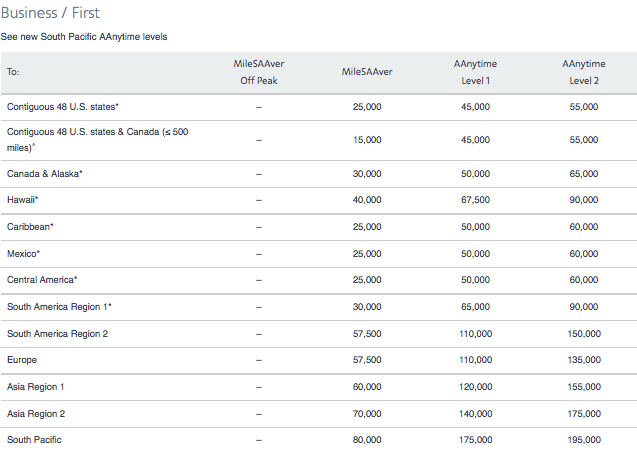 There are three basic types of American Airlines rewards: off-peak, MileSAAver, and AAnytime awards. Off-peak awards aren’t technically listed as separate on the AA website, because they have the same restrictions as MileSAAver awards. But they’re a great way to make your miles go further if available during the off season. 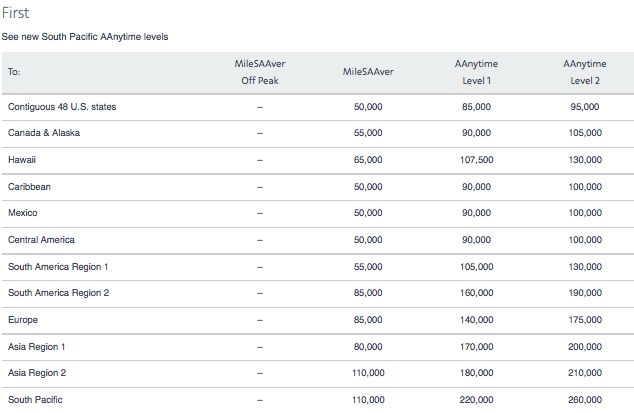 AAnytime Awards, which can be booked on any flight with no blackout dates, include a number of perks that make them more akin to premium economy fares, justifying the sizable increase in points required for booking. In addition to expedited check-in, security screening and priority boarding, you get complimentary upgrades to preferred seats, such as exit rows. What were previously known as off-peak awards, and now fall into the category of MileSAAver level one on the new five-tiered award chart, are some of the best redemptions in the industry for a number of destinations. The 40,000-mile round-trip flights between the U.S. and Europe (matched only by British Airways Executive Club, and there only to and from select destinations) and 50,000-mile flights to Japan and Korea are the best rates you’ll find anywhere for these routes. 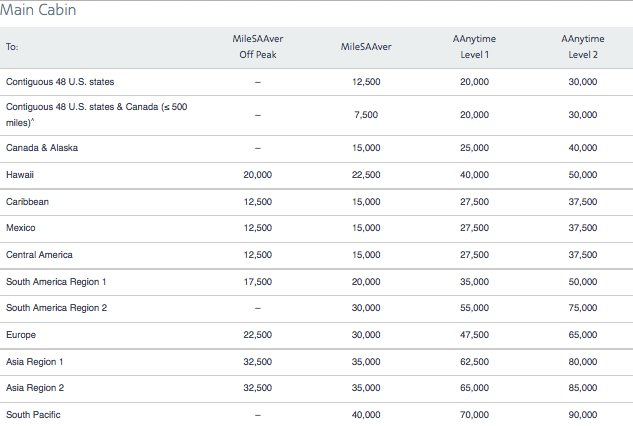 While the American Airlines AAnytime rewards have long represented a decent value proposition a significant increase in perks for around twice the miles, similar to booking a premium economy award the new award chart that went into effect this June has completely changed that landscape. Now AAnytime is not the most accurate name for these awards. You can book a seat anytime without blackout dates, but you have no idea how much it will cost. It’s not even published, so the airline may charge a point value akin to 1 cent per mile or worse in relation to the price of purchase of that ticket in cash. AAnytime awards are now split into three levels, so if you can get one at the lowest level, it’s a decent value, but avoid any AAnytime awards beyond that. With AAdvantage miles, you can only upgrade American Airlines, British Airways and Iberia flights, unfortunately. However, they are marvelously transparent, compared to many other airlines, about which fares you can upgrade and how much that will cost.No matter how far you are flying, you’ll never have to pay more than 25,000 miles to upgrade the most discounted cash economy or business fares to the next level of service, and you only need 15,000 miles for North America, Central America and northern South America. From full fare economy, upgrades start at 5,000 miles. Upgrades are done on a one-way basis, for a maximum of three segments. You’ll have to be careful with this on long, complex itineraries, but it offers a nice level of flexibility. If you have a round-trip that has a red-eye in one direction, you can upgrade that direction, and keep the other in coach. Currently, the Citi® / AAdvantage® Platinum Select® MasterCard® offers 30,000 bonus points after a $1,000 minimum spend in three months and includes early boarding on all flights, one free checked bag for you and four additional travelers, $100 AA flight discount and 10 percent of your redeemed miles back every year all for a $95 fee, waived the first year. The Business card is similar, except you get a 5 percent bonus at the end of the year, rather than 10 percent, and a companion certificate in lieu of the flight discount. The Citi® / AAdvantage® Executive World Elite™ MasterCard® comes with the same sign-on bonus, but an annual fee of $450, which earns a host of additional benefits, including Admirals Club membership, expedited security screening and boarding, double miles earning, no foreign transaction fees and concierge service. As far as credit cards with fees go, it has fewer perks for that outlay than its competitors, but it’s the only card that includes Admiral Club membership, after its been stripped from American Express cardholders. For several months this year, Citi also ran a promotion for 100,000 bonus miles with a $10,000 spend in the first three months. Many frequent travelers are stocking up on US Airways points through the Premier World Mastercard from Barclays, which carries a very generous bonus, in anticipation of the final consolidation of the two airlines. As the merger with US Airways progresses, the US Airways cards may completely disappear, or they may turn into additional options connected to American.